Well I’m quite a fan of pancakes. 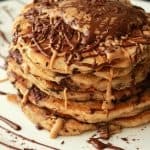 Which you may know already since I’ve made my classic vegan pancakes, blueberry pancakes, coconut pancakes, chocolate chip peanut butter pancakes and some crepes too. 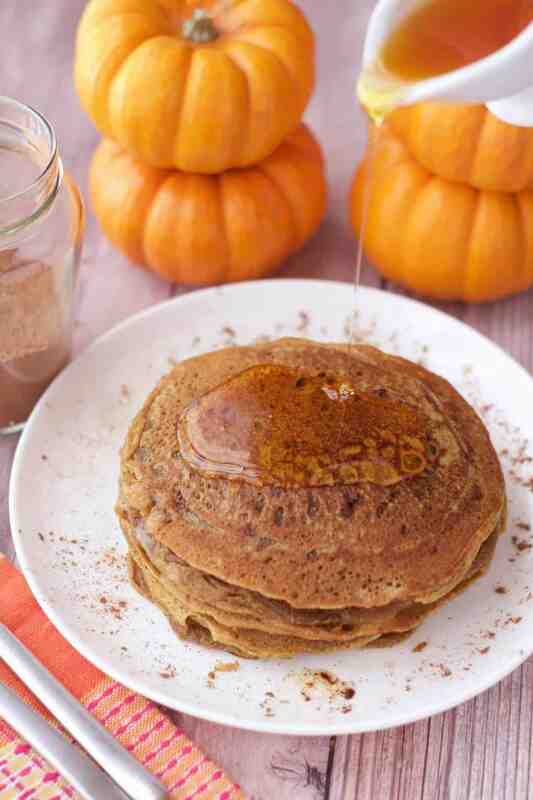 But now it’s time for some vegan pumpkin pancakes! Because it’s fall season and there’s pumpkins everywhere and it’s pretty awesome! I had to use significantly less actual pumpkin in these pancakes than I wanted. I started off going for a whole cup of pumpkin for these babies, quite contrary to other bloggers advice that too much pumpkin equals too wet pancakes. But I did the equivalent of fingers in the ears and singing la-la-la-la at the top of my voice because I wanted lots of pumpkin! But sadly it just didn’t work out. Well…..they still tasted delicious in my view, but no matter how many times you flipped them over to extend the cooking time, they just never seemed to get entirely cooked in the middle. So I decreased the pumpkin bit by bit, to 3/4 of a cup and then to 1/2 a cup and eventually all the way down to a 1/3 of a cup. So a lot less than I wanted but hey, the result was fab. The saving grace is the homemade pumpkin pie spice. You don’t actually need to use all that much pumpkin when you have that delicious pumpkin pie spice making everything so delicious. 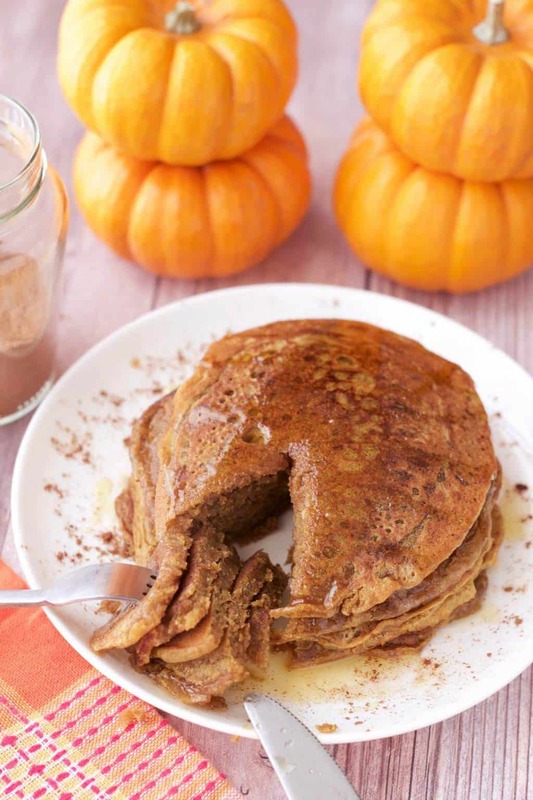 This recipe only makes 5-6 vegan pumpkin pancakes so it’s not a large batch. If you’re cooking for more than 2 people then definitely double it up. 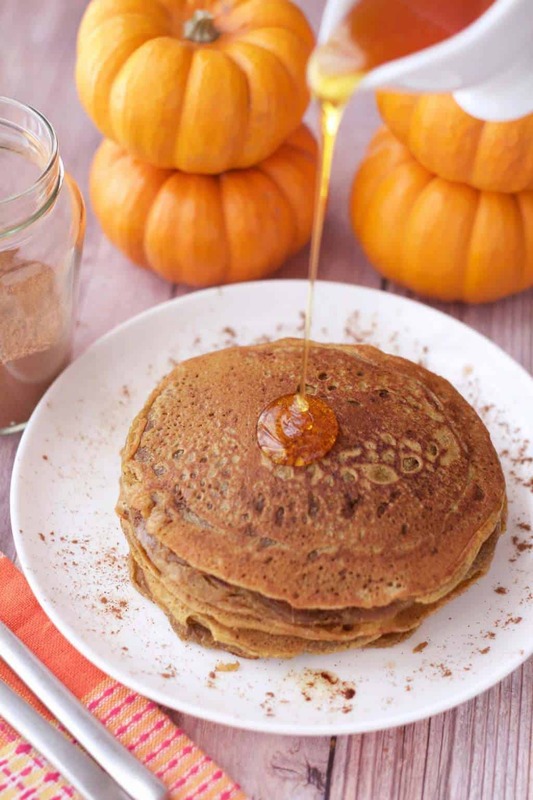 Serve with vegan butter, syrup and extra pumpkin pie spice! 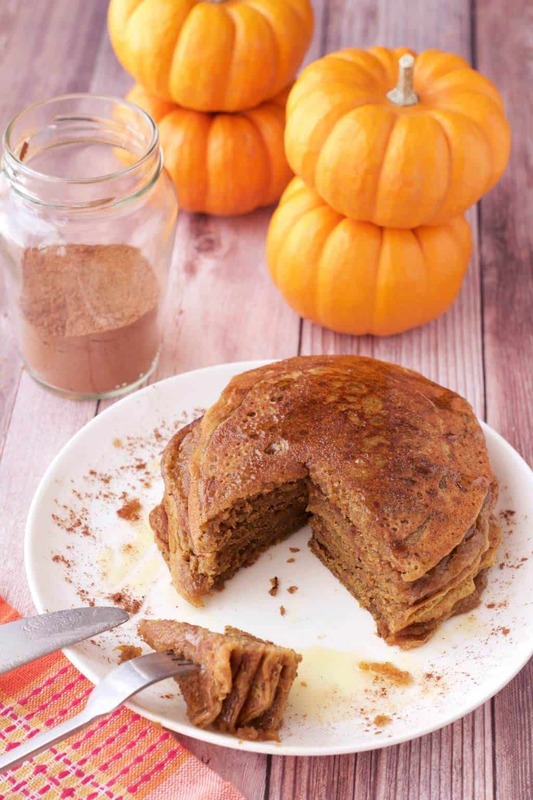 So let me know what you think of these vegan pumpkin pancakes in the comments below and please rate the recipe too, thanks! If you haven’t already, sign up to our email list! You’ll get an awesome recipe ebook entirely free (contains 10 fabulous recipes) and you’ll stay up to date with all the latest recipe posting! Yippee yay! 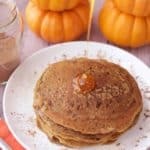 Deliciously spiced vegan pumpkin pancakes! Richly satisfying and ideal for breakfast served with some vegan butter, syrup and extra sprinkles of pumpkin pie spice! 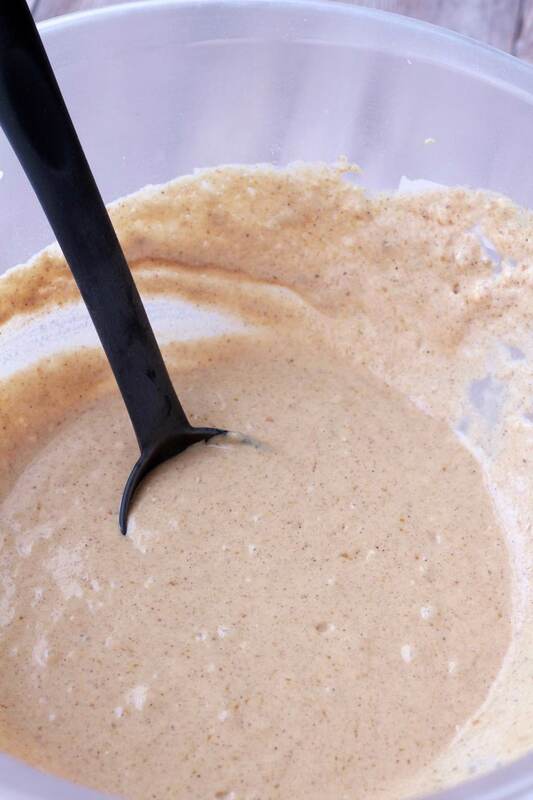 Sift the flour into a mixing bowl and add the sugar, baking powder and salt and mix together. Pour in the coconut milk and add the coconut oil, pumpkin pie spice and pumpkin puree and whisk to mix properly and remove lumps. Heat a frying pan with a tsp of coconut oil. When the pan is very hot, pour in some batter (roughly 1/4 cup at a time). When little bubbles appear on the top, flip the pancake over. 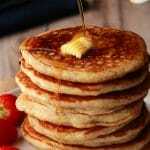 Continue to flip the pancakes regularly, pressing down with your spatula to ensure no wet batter remains in the center. When cooked, repeat the process until your batter is finished. 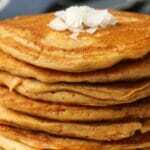 Serve the pancakes with vegan butter, syrup and sprinkles of pumpkin pie spice. Thanks to you, my little girl eats pumpkin. Love this recipe, please keep them coming. I just made this recipe and found the batter was too thick. I made a pancake to test it out and it was more like a “cake” than a pancake. The good news is it tasted great! SO, for the rest of the batch, I added in about a 1/4 cup of Almond Coconut milk that I had on hand and the rest came out even better. Very good recipe. Thanks so much for sharing! Just made pumpkin pancakes and like another commenter I also needed to add more non dairy milk to make cakes more to my preference. So yummy thank you for all your wonderful recipes. I’m wondering if it is supposed to be 1 teaspoon of baking powder/?? 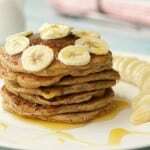 mine taste very strange with 1 TABLEspoon?? It is supposed to be a tablespoon, not a teaspoon. It makes them very fluffy! 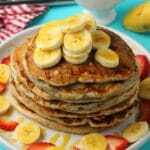 I’m not sure why yours taste strange, I always use this much baking powder in my pancakes, it could be that you could use less without an issue. I have to watch and be sure I use baking POWDER and not baking soda, but we have made this recipe and, while it does fluff up a lot in the bowl while waiting to be used in my pan, but they havent tasted weird? Even when I have to mix my own baking powder. I made these this morning….my daughter’s comment….these are freaking delicious! I used almond milk so next time would use a little more because I like a thinner pancake. The flavor on these is out of this world. Thanks so much for the recipe! I made these pancakes but my batter was very very thick. I added more coconut milk and it thinned out nicely though. THEY WERE FANTASTIC. LOVE THESE! 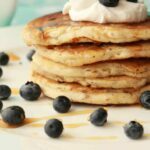 I rarely write recipes of reviews, but these were not only the fluffiest pancakes I’ve ever had, but were also the BEST pancakes I’ve ever made! I subbed in Bobs Red Mill GF flour, used maple syrup in place of sugar, and added a tad more milk, as the batter was super thick. I also tossed in some pumpkin and sunflower seeds. Highly recommended. Bravo!